Hiking starts with your feet—both literally and figurately. If your feet aren’t healthy, protected, and able to properly grip the rough terrain you’ll be encountering, you won’t make it very far off the beaten path. That’s why we recommend a high-quality hiking shoe that is not only durable but offers superior traction and waterproofing. 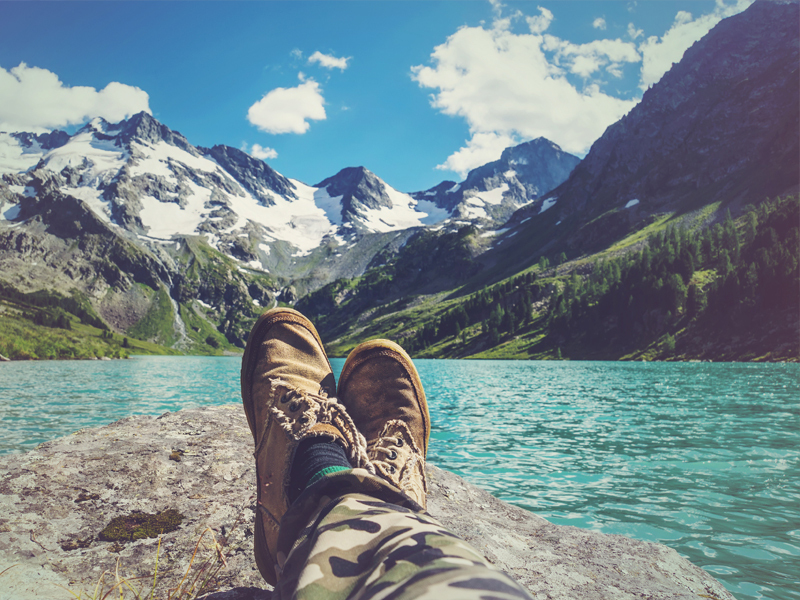 To help you on your quest for adventure (and the perfect hiking shoe), we’ve put together this list of the best hiking shoes for men. From fashionable and functional options to exploration-worthy sandals—yes, seriously—you’re bound to find something that fits your tastes and your needs. So, read on, traveler! Well known for their style and functionality, Timberland produces some of the best boots on the market. Their White Ledge Waterproof Boot carries on that tradition in the hiking world, providing a high-quality build of leather and rustproof metal that is sure to endure anything you throw at it. To make sure you also endure, the boots are equipped with extremely grippy soles that are patterned for maximum traction. Lightweight and breathable, the Merrell Moab 2 Vent Hiking Shoe is both flexible and durable. It is a lowcut show, allowing for ankle mobility, and features a well-ventilated construction to help prevent discomfort on longer hikes. The sole is designed to grip on everything from sand to slippery stones, giving you the peace-of-mind to go forth boldly on your next adventure! There is no worse feeling than hiking miles with wet feet. Not only is it uncomfortable, it can be dangerous for your health. With the Columbia Newton Ridge Plus II, you can kiss those worries goodbye. Fully waterproof, but still comfortable and breathable, this hiking boot is designed to give you the ultimate traction, durability, and protection on the trail—no matter how extreme that trail might be. From the rugged leather upper to the extreme traction of the sole, the KEEN Targhee II is a hiking shoe that means business. The tough, grippy sole extends up the side of the shoe subtly—just enough to provide protection from sharp stones or limbs and offer traction even on steep slopes. This extreme functionality doesn’t come at the expense of comfort, though—you might even find yourself wearing these away from the trail! If you’re looking for a boot that looks just at home on the runway as it does on the trail, the Timberland Premium Waterproof Boot is for you. The leather construction is extremely stylish but also functions to support and protect the ankle when venturing outdoors. The monochromatic color scheme adds a sense of high fashion, while the durable rubber sole and metal eyelets speak to the versatility of this boot. It’s truly a do-it-all option. Fashionable? Check. Functional? Check. Budget-friendly? Check. The Skechers Verdict boot is a fantastic option for hikers of all intensities and experiences, as it features an all-leather upper construction, classic rubber sole, and noteworthy design. It looks tough because it is. It’s sure to endure whatever you throw at it—from long days at work to hard days on the trail. For a boot that looks ready for an expedition because it is, look no farther than the Hi-Tec Bandera. The mixed construction of leather, suede, and durable nylon make it obvious that this boot means business on the trail. Anywhere you want to go this boot will help you get there! The extreme traction of the rubber sole is sure to help you climb any slope and maintain ga rip on even the most slippery of surfaces. It also extends slightly up the side of the boot for an added layer of protection. We know what you’re thinking—a sandal doesn’t belong on a list of the best hiking shoes—but don’t write off the KEEN Newport H2 Sandal yet. Not only is this shoe designed to get wet—both on the trail and in the wash—it provides fantastic traction no matter where the trail takes you. From the shores of the ocean to the peaks of the Rocky Mountains, this sandal will get you there and be supremely durable and breathable while doing it. It has all the advantages of a hiking shoe with the comfort of a sandal—what’s not to love? If you haven’t caught on yet, let us make this clear: Timberland is a mainstay in the boot world. The Chocorua Trail Hiking Boot is no different, offering the complete package for the hiker looking for a high-quality product. It is constructed of durable, waterproof leather that looks great, will last indefinitely, and provide protection from just about anything nature throws at you. The traction offered by the rubber sole is nothing to overlook, either. Throw in the anti-fatigue comfort technology and you have a boot that is not only functional but pleasant to wear. Hiking shoes are known for their tough construction, great traction, and overall outdoor functionality, but the Vasque Breeze 2.0 believes that comfort should be standard as well. With their extended comfort technology, they deliver comfort and breathability without sacrificing the durability everyone expects from a hiking shoe. The leather upper, grippy synthetic sole, and thoughtful design make this boot an ideal choice for hikers of all levels—beginner to elite. One look at the Salomon Quest 4D 2 GTX Hiking Boot and you know it’s high-quality and comfortable. From the thoughtful cushioning around the ankle to the rubber toe box that offers superior protection, every detail of this boot has been designed to be comfortable and functional. It’s easy to imagine yourself with your mountaineering gear strapped to your back and these boots laced up tight as you make your way to an unbelievably scenic campsite. Should you cross any streams on the way, fear not—the soles are insanely grippy and the boot is waterproof! In true Timberland fashion, the Flume Waterproof Boot manages to be both stylish and functional without sacrificing one for the other. The premium leather is full-grain and waterproof, offering a distinguished appearance that serves a purpose. It has a foam footbed for extreme comfort, no matter how long you’re on your feet. Traction hasn’t been forgotten, either, as the sole is extremely grippy and extends up the side of the boot just enough to add protection and grip to any situation.